A building burns so a girl can get home. And she does get to go home, to North City where her father rules the dark side. Where he offers protection to the humans from the monsters, for a price. All she wants is to prove that she is a Harker, her fathers daughter. Ruthless, calculating, capable of standing by his side. There is a boy who wants to be more. He wants to offer himself up to protect the city. His city, South Side, ruled by his father. Kind and gentle, Henry Flynn wants to save the city, return the monsters to where they came from. August, and his brother and sister are his secret weapons. He wants them safe, so he keeps them hidden. Until now. August finally has a mission... It is NOT what he had in mind. I won't say too much more about the story, since we are a ways from its release date, but I will say that I loved this book. Initially, it did take some time for me to become invested, but once I did that was all she wrote. I think the beginning, me struggling to get interested, was definitely ME, not the story, so don't let that scare you away. 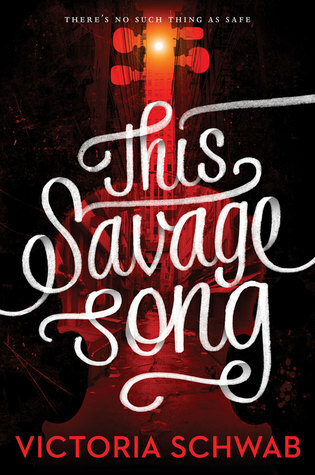 This Savage Song is full of action. The darkness is full of teeth and eyes as red as blood. The characters full of loss and bone deep pain, fear and anger and worry. They are strong, and weak at the same time. Struggling to find themselves, to figure out who they really are. Kate and August are stunningly wrought characters, full of life. I couldn't help but follow their stories, individually and apart, with all of my attention.